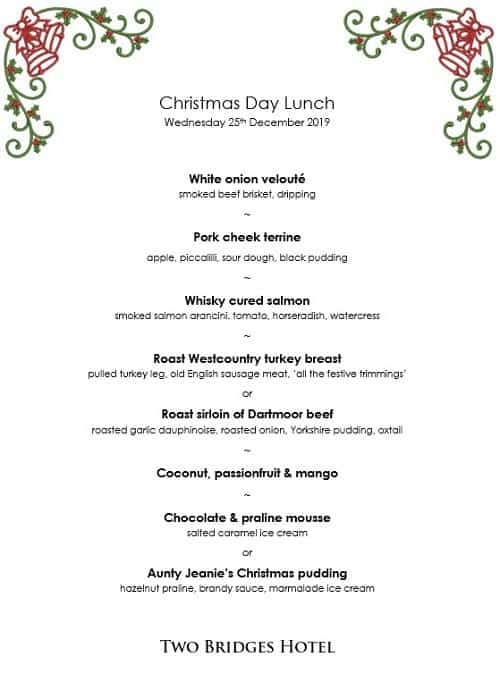 You are warmly invited to join us at the Two Bridges Hotel in the heart of Dartmoor National Park for our traditional Christmas Day Lunch. Relax, and enjoy a delicious six course lunch in the beautifully festive surroundings of the Two Bridges Hotel. Join us at 12 noon for a welcome drink, and we'll be serving lunch at 12:30. Christmas Day Lunch at the Two Bridges Hotel is always popular - it's best to book early. Five course Christmas Day Lunch £99 (children under 12, £60). Call 01822-892300 to book your table. We will request a non-refundable deposit of £20 per person to confirm your booking, with the balance payable by 30/11/19. We are pleased to cater for special dietary requirements with advance notice – if you need to know about the ingredients we use, please ask.